Waterproof, stain resistant & easy to clean. Effective moisture & vapor barrier. Suitable for use over poured concrete or concrete block walls. BrightWall® Paneling® is only available from a certified installer in your area. Contact us to request an inspection & get a free cost estimate to have it installed in your home. Wall & post treatment. 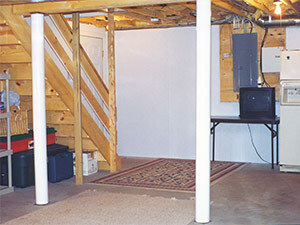 BrightWall® panels are strong and durable, but flexible enough to wrap around steel posts in the basement. BrightWall® Basement Wall Panels can easily transform damp, ugly basement walls into bright, beautiful walls that never need paint or other maintenance. 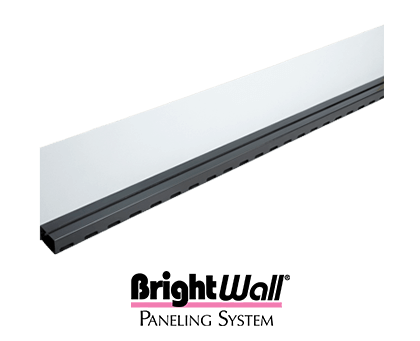 The BrightWall® system includes semi-rigid, white plastic panels, trim strips used to join panels together and plastic fasteners that are used to attach panels to the foundation wall. Like our other basement wall products, BrightWall® panels are designed to work with our waterproofing system. Once installed, BrightWall® panels will direct wall seepage down to perimeter drain lines that carry water to a sump pump. Instead of painting basement walls and worrying about when peeling and seepage will start, why not do away with these problems by installing BrightWall® panels? Call to day to schedule a free consultation and BrightWall® installation estimate.